An innovative hospitality bedding solution designed for quick and easy bed setups, the Palmetto Eco-Fill White Stripe Comforters offer the functionality of comforters with the look and feel of luxury dobby stripe duvet bedding. 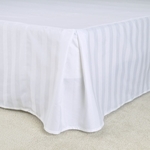 These Hospitality Comforters are made by combining our low-wrinkle T-250 white dobby stripe duvet cover fabric with our down-alternative Eco-Fill duvet inserts to create an innovative 3 layer comforter that looks like luxury duvet bedding. 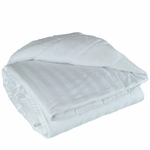 Featuring fast-drying, non-clumping recycled Eco-Fill for cozy warmth and machine laundering combined with a low-wrinkle T-250 poly-cotton top layer for beautiful, wrinkle free beds without the need for extensive ironing. If you want the look of dobby stripe duvet bedding, but need a top of the bed option for your hospitality or temporary lodging property that sets up faster and without aggravation, you will want to check out the Eco-Fill White Stripe Comforters. The Eco-Fill Comforter Bedding Collection items are available open stock by the case, so weather you need complete comforter sets or individual comforters, your needs are covered!